Miles de Manos (Thousands of Hands) is just one of a number of promising programs I got a small taste of recently, while their teams were visiting up here in Oregon for the inaugural Strong Global Communities, International Conference on Prevention Implementation – an event which I hope will be an annual international gathering of youth crime prevention practitioners. 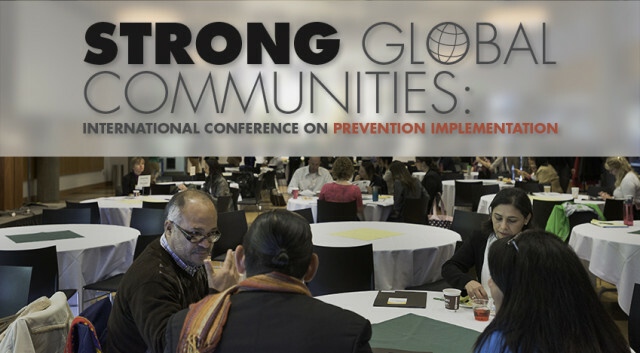 A key component of their work involves drawing key individuals at the national as well as at the community level, out of their various silos in order to work together on prevention efforts – a model from which the U.S. might learn a thing or two. Their work is inspirational on a number of counts, due not only to their innovative approaches but to the fact that, despite representing a half dozen different countries from Honduras to Chile and points in between, they are overcoming challenges of monumental proportions – a much higher percentage of homeless, orphaned children then we usually see in U.S. schools, whole communities speaking unique dialects rather than the country’s primary language, miniscule school budgets, extreme levels of unemployment and entire populations still recovering from the polarization and trauma associated with recent atrocities and civil war. Miles de Manos is a wonderful model of consulting done well. They start by reaching out to local teachers and parents, working closely with both groups to develop a shared model of what’s to be accomplished, built on a foundation of non-violent positive behavior support and connectivity among all the players. Just as we have seen in the U.S., communicating clear expectations, encouraging positive behavior and establishing consistent consequences pays off ten-fold when it comes to success in schools. The program has been field tested in Intibucá, Honduras, and has plans to roll into El Salvador and Guatemala later this year.